Out of the box, it's your standard black slab with thin sides and a convex back. It's a convenient size (for a male hand), substantial, but not too heavy. The dimensions and weight are in the Specifications below. Yes, there are sexier phones with thinner edges, better rubbery or metallic finishes, but if it's a fashion phone you want, you won't be buying the Moto G to start with. You can choose to customise your Moto G direct from Motorola using the Moto Maker, to personalise the rear shell cover and metallic accent. I didn't bother, as mine is never seen without a case. That's because I don't consider phone build quality in general to be that high; in my view all smart phones are fragile plastic enclosures with glass faces that bend, flex and break when dropped - Motorola being a little better, perhaps. All my phones go into a padded flip case, so when I inevitably drop them on a hard surface, the case takes the damage. There's a shiny power button and a volume rocker switch on the right, both of which are somewhat narrow for my liking. The other three controls are virtual buttons in the glass front. Otherwise, it's the standard nano-USB socket at the bottom and an off-centre headphone jack on top. The Moto G has a removable rear panel giving access to the SIM and microSD slots (cards up to 32GB), and removable battery. It's nominally water-resistant, within the limits of the IPX7 rating, meaning it can be dunked in up to one metre of water for up to 30 minutes. So not fully water-proof like some of the Sony handsets and others. I haven't tested this. I'm guessing this is for common occurrences of dropping your phone down the can. Apparently Motorola's 'ingenious hand gesture short-cuts' allow you to access certain parts of the phone. For example, a double karate chop will turn on the phone's rear flash-light, a double twist of your wrist will instantly open the camera. Either I'm doing it wrong, or these don't work very well. Perhaps I didn't practice enough for fear of looking like a break-dancer or someone throwing a fit. The 3rd Gen Moto G is available in two specifications. The cheapest model only comes with 8GB of storage and 1GB of RAM. I opted for the 16GB version which comes with 2GB of RAM) which is about £20-£30 more. Only 4GB or 12GB is actually available to the user after loading Android and standard apps. Extra storage isn't a problem, though, thanks to the Moto G's microSD card slot. The display is a 5in, 1,280x720 resolution display. It isn't going to compete with the brightness and clarity of the Galaxy A3's Super AMOLED display, but it makes for a more manageable handset than the big 5.5in Vodafone Smart Ultra 6, and it does give an even spread of tones, only tailing off slightly in the red spectrum. Blacks are reasonable, viewing angles are good, outdoor visibility, hmm, variable. The Moto G has a quad-core Qualcomm Snapdragon 410 chipset cranked to 1.4GHz rather than the usual 1.2GHz. The 2GB Moto G is highly competent when it comes to multitasking and app-switching, provides fast web-browsing. Which is why I went for this and not the 1GB model. There are plenty of handsets in this price bracket which feature the more capable octa-core Snapdragon 615 chipset; such as the EE Harrier, Sony Xperia M4 Aqua and Vodafone Smart Ultra 6; it's your choice in the price/performance equation. I can't answer for games performance, but video recording and playback are smooth even with other apps running. The 3rd Gen Moto G has a 2,470mAh battery, which in my subjective and highly unscientific testing lasts well between charges. It's not quick to recharge, though. Which is to say, it takes forever. My hour-long commuting time only provides about a 40% top-up. 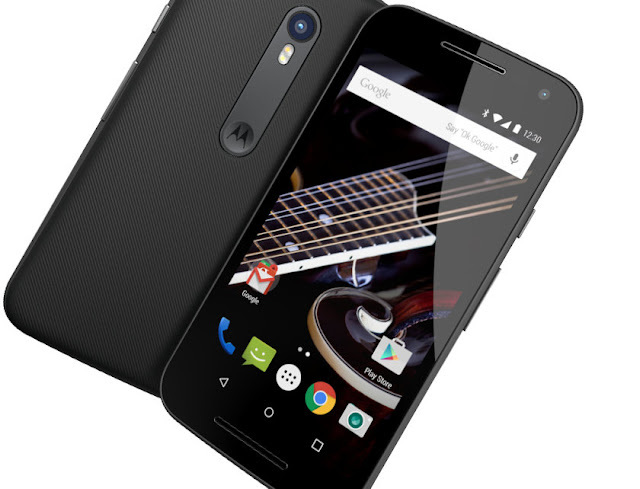 The 3rd Gen Moto G has a 13-megapixel rear camera using the same sensor found in the Motorola-made, twice-the-price Google Nexus 6. Supported by a dual LED, colour-balancing flash, this adjusts colour temperature so that flash-lit shots look more natural. The front-facing camera is a decent 5-megapixels. Camera detail is good and a competent photographer can get good results indoors or outdoors. It excels outdoors, with rich colours and contrast. There's no delay in shooting and the camera controls are a breeze - there's no on-screen shutter button, so all you need to do is tap the screen. The settings include a dramatic HDR, Panorama and Motorola's new Night mode Focus and exposure controls include a moveable focus bracket on screen to help frame the shots and an exposure slider to control light levels. The 3rd Gen Moto G runs almost pure Android; mine came with 5.1.1. Motorola pushes out updates quickly, with a clean, simple Android UI, without any telecoms carrier's crapware, but some useful tweaks to settings and notifications that are worth exploring. There's full 4G support, and with a good data plan, the Moto G is a respectable Internet performer. Going SIM-free puts you in a world of varying prices now that the Moto G is an established model. Competitors include the Sony Xperia M4, the EE Harrier and Vodafone Smart Ultra 6. Yes the chip-set may be ageing, but the performance of 16GB / 2GB model lifts it out of the budget smart-phone bracket. Three months in and I've barely scratched the surface of the 3rd Gen's camera, media playback, and Internet capabilities. If you want to use it just as a phone, call reception is good, operation is simple. Pure Android is a joy after years of carrier customisation ('de-provement' - copyright Steve Martin), even if I haven't found all the settings yet - and there are many. Compared to the constant frustration of my father's swish Sony Experia, I'll take the Moto G any day.